Donald Trump’s signature campaign promise to build a wall on the U.S. border with Mexico has sparked a funding fight in Washington that first led to a record 35-day partial government shutdown, and now a battle over Trump’s decision to declare a national emergency to secure additional money after Congress didn’t approve as much as he wants. 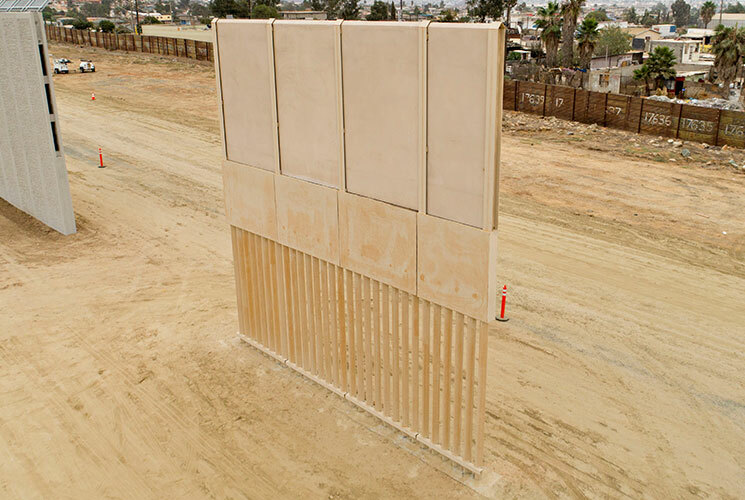 So far, a handful of prototypes have been constructed at a site near San Diego, and Congress has approved funding to renovate or replace existing barriers and build new fencing in Texas. Questions still loom, including how much of a wall will be built, how much it’ll cost and who’ll pay for it. Based on what we know so far, here are answers about how the project could move forward. What does the U.S.-Mexico border look like right now? The border is almost 2,000 miles long, two-thirds of which follows the Rio Grande River. Land along the border cuts through cities, including Nogales, Arizona and El Paso, Texas, as well as rural farmland, desert, arroyos, craggy mountains and wildlife reserves. The border features an array of existing fencing, more than 30 border patrol stations and 25 legal ports of entry. Where are border barriers already in place? Barriers span 654 miles of the U.S.-Mexico border, mostly along the western half. Much of the southern borders of California, Arizona and New Mexico have existing barriers, ranging from 18-foot-tall iron fencing and corrugated metal to makeshift vehicle barriers and barbed wire. There are 354 miles of primary pedestrian fencing—tall barriers that are used to prevent people on foot from crossing the border. In some areas, this is augmented by a second or third layer of fencing. About 300 miles of existing border fencing are vehicle barriers, meant to restrict entry to cars and trucks. These structures are common in more sparsely populated, desert terrain in Arizona and New Mexico. Many miles of border don’t have a man-made barrier but lie in mountainous areas or along the Rio Grande River, which provide a natural obstacle to both migrants and wall construction efforts. Nearly half of all border apprehensions occur near the southernmost tip of Texas. The area, known as the Rio Grande Valley Border Patrol Sector, accounted for 41 percent of all apprehensions in fiscal 2018. From 1998 to 2012, most apprehensions occurred near Tucson, Arizona. Much of Arizona’s southern border is now fenced off. That has significantly reduced crossings there but led to increased crossings further east, in Texas. There were 396,579 border apprehensions in the southwest U.S. during fiscal year 2018—many were people presenting themselves to border agents and seeking asylum. That’s according to U.S. Border Patrol figures, and it also includes people who were caught multiple times. Apprehensions have declined significantly since a peak in the year 2000, but have remained steady for the past decade or so. It’s less clear how many people successfully cross the border. Customs and Border Protection tries to estimate the total based on surveillance footage, evidence of movement (e.g., footprints, overturned rocks, litter) and reports from local residents. A Department of Homeland Security report estimated that CBP had an effectiveness rate of between 55 to 85 percent in fiscal year 2016—versus 35 to 70 percent a decade ago. The rate varies depending on how the total number of attempts is estimated. Outside estimates are less rosy. In a 2013 report, the Council on Foreign Relations estimated that Border Patrol’s success rate was in the 40 to 55 percent range. The Institute for Defense Analyses, a nonprofit, nonpartisan research group that works solely for U.S. government agencies, estimates that about 200,000 people made it across in 2015—down from an estimated 2 million entries in 2000. Douglas Massey—a Princeton University sociology professor and co-director of the Mexican Migration Project—uses a different methodology that relies on interviews with families in Mexico and destination cities. Massey estimated only about a 20 percent apprehension rate in 2016.
Who are the people apprehended at the U.S.-Mexico border? The majority are from Central American countries fleeing violence and instability. While the number of Mexican people crossing the border illegally shrank in the past few years, there has been an increase in asylum-seekers from El Salvador, Guatemala and Honduras. In fiscal 2018, 107,212 family units were apprehended on the border—an increase of 42 percent from the previous year. The number of unaccompanied minors increased 21 percent to 50,036.
Who put up the current border barriers? Most of the existing border fence was built after 2006, under President George W. Bush. Construction began in the early 1990s along the California border. In 1996, the Illegal Immigration Reform and Immigrant Responsibility Act (IIRIRA) gave the government broad authority to build barriers, resulting in 14 miles of fencing that was built during the George H.W. Bush and Clinton administrations. The barriers targeted border crossers between Tijuana, Mexico and San Diego. In 2006, George W. Bush signed the Secure Fence Act, which ultimately increased the total barrier to 654 miles of reinforced fencing along the U.S.-Mexico border. A 2008 DHS Appropriations Act rewrote the IIRIRA to require no less than 700 miles of reinforced fencing along the southwest border. The Department of Homeland Security had finished most of the fencing by the time President Barack Obama took office in 2009, but the agency still has 46 miles of authorized, unfinished fencing to be constructed. Trump has cited the Secure Fence Act as the legal authority to restart the work on border barriers. What other methods are used to enforce the border? The agency said it has increased the number of personnel on the ground at the southwest border to more than 18,500 in 2018 from about 9,100 Border Patrol agents in 2001. U.S. Customs and Border Protection has expanded coverage using Unmanned Aircraft Systems, or drones, to the entire Southwest, according to the Department of Homeland Security. Officials are also pursuing technologies such as cameras, imagers and unattended ground sensors. What is Trump’s wall proposal? Trump’s statements about the wall have changed over time. In June of 2017, Trump also told reporters he was seriously considering covering the wall with solar technology. However, none of the eight border wall prototypes included solar panels. In July of 2017, Trump told reporters he wanted the wall to be “see through” and suggested it be made of steel rather than concrete. “One of the things with the wall is you need transparency. You have to be able to see through it. As horrible as it sounds, when they throw the large sacks of drugs over, and if you have people on the other side of the wall, you don’t see them—they hit you on the head with 60 pounds of stuff? 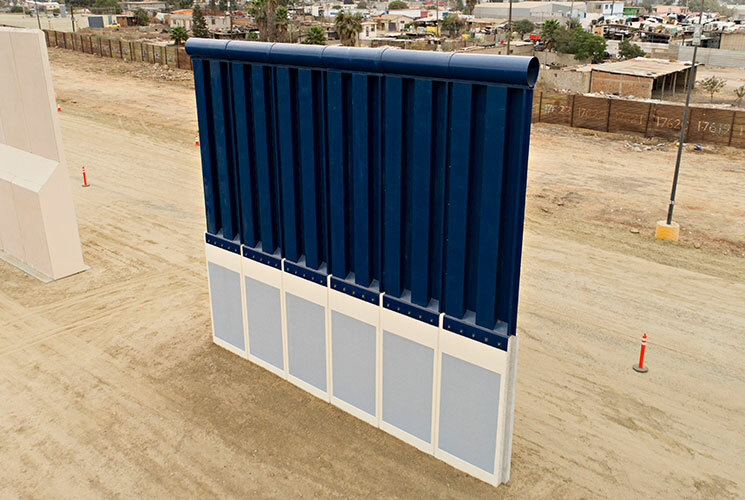 It’s over.” Two of the originally-constructed prototypes contain slatted steel bars that could provide limited visibility across the border. A Trump administration proposal early in 2018 called for a more modest 722-mile mix of wall and fencing, mostly updating what’s been in place for decades, while relying on drones and other methods to secure the rest. It proposed spending $18 billion over 10 years and would have reportedly resulted in a total of 970 miles of fencing or barriers along the southwest border. How long would the wall be? The length of the wall itself has been the subject of mixed messages from the Trump administration, with suggestions anywhere from 500 miles to the entirety of the U.S.-Mexico border. In March 2017, Customs and Border Protection told the Senate Homeland Security and Governmental Affairs Committee that 1,827 miles of the border could contain a physical barrier. This would cover the extent of the currently un-walled portion of the U.S.-Mexico border. How much would it cost to build Trump’s wall? Estimates range from almost $6 billion to $67 billion, depending on whom you ask and what ultimately gets built. Trump has estimated that the wall can be built for a figure ranging from almost $6 billion to $12 billion, and his first budget requested up to $2.6 billion in fiscal 2018 toward planning, designing and building it. Congressional Republicans have said they expect it would cost from $12 billion to $15 billion, based on what it cost to build existing border fencing. According to Reuters, an internal Department of Homeland Security report said the wall could cost up to $21.6 billion. Independent estimates have been much higher. 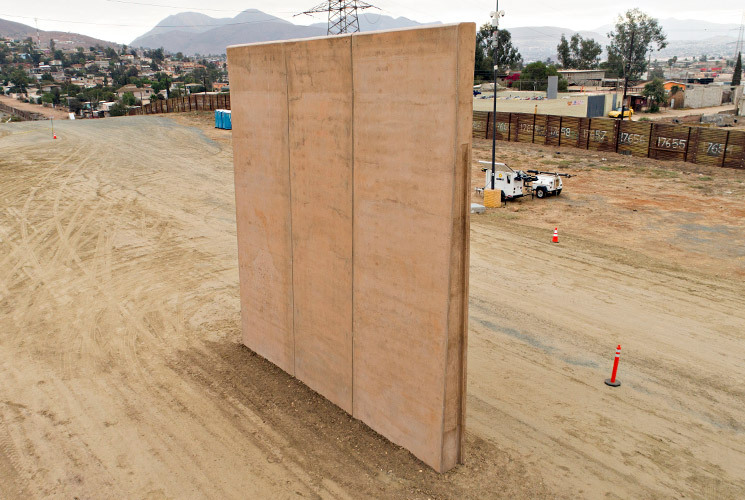 A study published in the MIT Technology Review said a 1,000-mile wall would cost from $27 billion to $40 billion based on estimated costs for concrete, steel and labor costs. Separately, Bernstein Research calculated $15 billion to $25 billion for labor, land acquisition and construction costs. In March 2018, Trump signed an omnibus spending bill with almost $1.6 billion set aside for border security, including renovating or replacing some existing barriers and $641 million for 33 to 37 miles of new fencing in the Rio Grande Valley Sector in Texas. Trump had sought $5.7 billion for the wall in the fight over fiscal 2019 funding that partially shutdown the government, but Congress approved only $1.375 billion on Feb. 14 for about 55 miles of new fencing in Texas. The president declared a national emergency to redirect $3.5 billion in military construction dollars for the wall and is using executive authority to reprogram $2.5 billion in drug interdiction and $600 million in drug forfeiture funds. Would Mexico pay for a wall? It’s unlikely Mexico will directly pay for a wall, as Trump has insisted. During his 2016 presidential campaign, Trump ran on a repeated promise that Mexico would cover any construction costs associated with a border wall. Mexican leaders have emphatically refused. Trump has suggested that the U.S. can recoup wall expenses from Mexico indirectly, including by cutting its trade surplus with the U.S. through a renegotiated North American Free Trade Agreement. He’s also floated the idea of invoking the Patriot Act to assess a tax on the money that immigrants living in the U.S. send to their relatives in Mexico. Mexicans sent $28.7 billion in these so-called remittances in 2017, according to Banco de Mexico. But a report from K&L Gates, an international law firm, said Trump’s plan raises constitutional questions and puts a significant burden on financial institutions. Stuart Anderson, the executive director of the National Foundation for American Policy, told the Washington Post that Trump’s interpretation of the Patriot Act is too broad, and he anticipates that the proposal would be challenged in court. Most American’s don’t think Mexico will cover the costs either, according to a CBS News poll conducted in August 2017. The poll asked American adults who they thought would pay for a wall if it was built—85 percent of respondents thought the U.S. would cover the costs, including 74 percent of Republicans. If Mexico doesn’t pay for a wall, who would? U.S. taxpayers would likely pay for any construction costs. Besides saying that Mexico would pay for the wall indirectly, Trump has floated the idea of covering a border wall with solar panels to help cover construction costs. At a June 2017 rally in Iowa, Trump told reporters, “We’re thinking about building the wall as a solar wall, so it creates energy, and pays for itself. And this way Mexico will have to pay much less money, and that’s good.” A formal proposal to do that hasn’t surfaced. Trump has proposed different funding amounts from Congress for the wall but rejected a legislative proposal in 2018 that would have provided $25 billion over 10 years because it contained “amnesty” provisions for undocumented immigrants. Does a wall need Congressional approval? Construction can begin immediately, but Trump has fought with Congress about approving the funding. Shortly after taking office, Trump signed an executive order requiring the Department of Homeland Security to “immediately plan, design, and construct a physical wall along the southern border.” Trump’s team believes the Secure Fence Act of 2006 grants him permission to begin constructing a border wall, and he has directed the DHS to use already available federal funding to start the process. That law permits the DHS to “take all actions the secretary determines necessary and appropriate to achieve and maintain operational control over the entire international land and maritime borders of the United States.” It also included approval for “physical infrastructure enhancements,” such as the wall Trump has proposed. But Trump previously had sought Congressional approval for the billions it will take to build a wall. 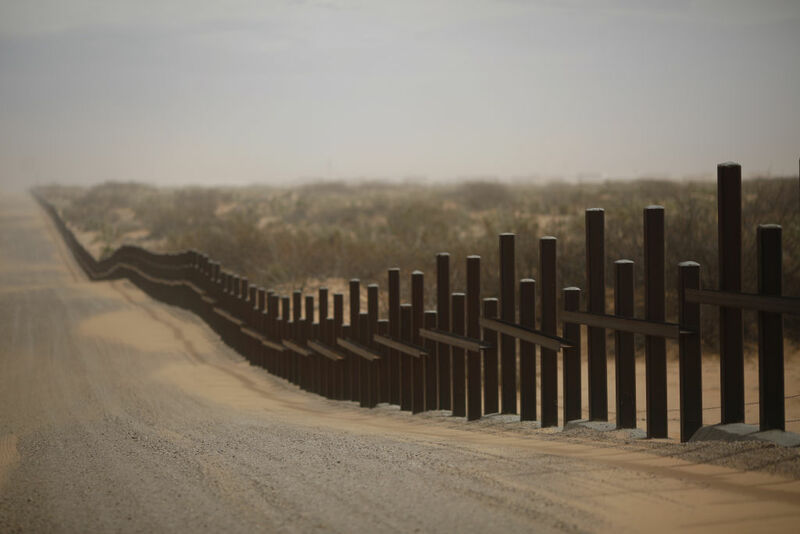 Lawmakers appropriated almost $1.6 billion in 2018 and approved an additional $1.375 billion on Feb. 14, though mostly for renovation and replacement of existing barriers with between 88 and 92 miles of new fencing in Texas. Trump has declared a national emergency to secure more funding. Democrats have supported spending billions more on additional border security measures such as improved infrastructure at ports of entry, but they haven’t approved as much money as Trump wants for a physical barrier. Could Trump declare a state of emergency to direct funding to the wall? He’s trying, and Democrats are vowing to challenge it in court and in Congress with a resolution to terminate the action. A national emergency is a declaration by the president that gives him or her special, temporary power to deal with a crisis. In the past, most such invocations have been related to foreign policy, such as prosecuting a war or responding to a global trade threat. International concerns explain most of the 28 currently-active national emergencies. On a few occasions, however, presidents have also used emergency declarations to further their domestic policy goals. Emergencies have been declared during crises ranging from the Civil War to the 1970 postal strike. In 1976, Congress adopted a law giving the president broad authority to declare a national emergency. But the law, passed as part of a sweeping set of legislation designed to restrain presidential powers after the Watergate scandal, also demands that the president invoke specific statutory authority for emergency actions. Courts have limited the president’s emergency powers before, including in a 1952 Supreme Court decision in which the high court said President Harry Truman could not use an emergency declaration to seize steel factories to ensure production during the Korean War. But since laws governing emergency authority have changed, some experts say it would be difficult to predict how the case would be viewed by the current Supreme Court, in which Republican-appointed justices hold the majority. Would eminent domain be used to acquire land for a wall? Most likely, since previous border projects have also used eminent domain. Two-thirds of the land along the border is private or state-owned. And most of that land is in Texas, where much of the border does not already have fencing. The Trump administration would probably need to use eminent domain to acquire the remaining land needed to complete a border wall. The U.S. government has used eminent domain to acquire land for existing sections of the border fence, and legal precedent is on Trump’s side. In 2005, the Supreme Court ruled, in Kelo v. The City of New London, that local governments may force property owners to sell out and make way for private economic development when officials decide it would benefit the public. Still, attempts to acquire land would certainly face challenges in court. Historically, wall-related land cases have taken years to resolve, with costly settlements often resulting. An Associated Press review of border-related eminent domain cases in 2012 found that the U.S. government spent approximately $15 million to acquire 300 properties along the border in Texas. Property owners, whose land would be caught between the wall and the Mexico border, are likely to file claims of lost property value, which could slow down any construction on a wall. Environmental activists sued the Department of Homeland Security in 2017 to stop the project, citing potential threats to endangered species including the Quino checkerspot butterfly and the Mexican flannel bush. The U.S. Supreme Court in December 2018 left intact a ruling that allowed the administration to proceed with construction. What’s been built under Trump so far? A few prototypes were built in 2017, and over 100 miles of existing barriers have been, or are slated to be, repaired or replaced. 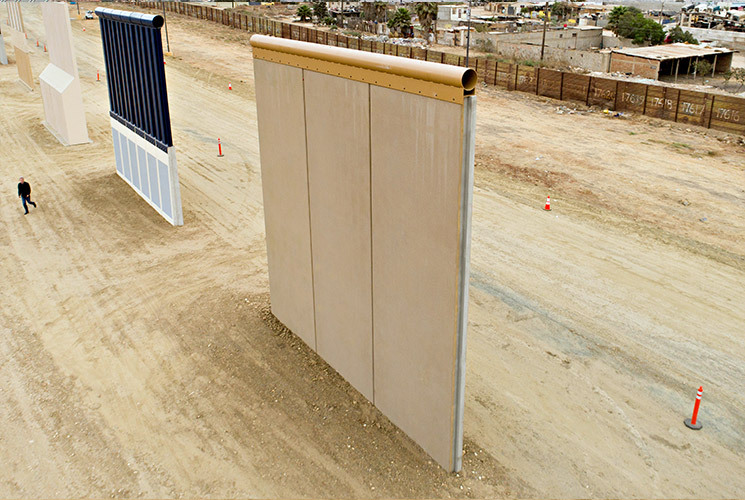 In early 2017, U.S. Customs and Border Protection began soliciting bids for two types of border wall proposals. The first called for a reinforced concrete design at least 18 feet tall, aesthetically pleasing on the U.S.-facing side and able to repel attempts to climb over the top or tunnel underneath. 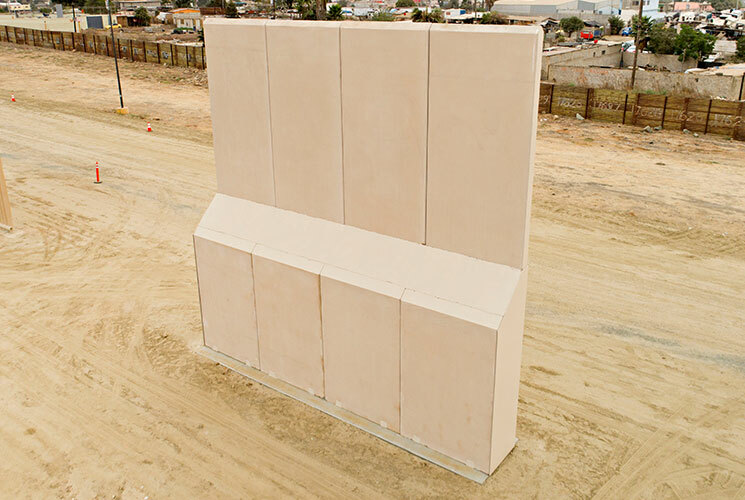 The second proposal requested a wall constructed from materials other than concrete, but with otherwise similar requirements. 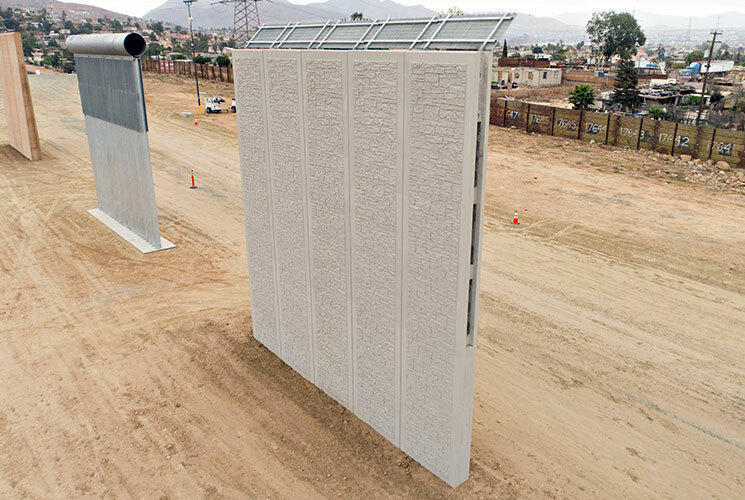 Eight wall prototypes were constructed in 2017 in a desert outside San Diego, California—four of them primarily concrete, two made mostly of metal and two others being hybrid designs of concrete, metal bars and steel plating. The mock-ups were tested for their ability to repel attempts to climb over, smash through or tunnel underneath. 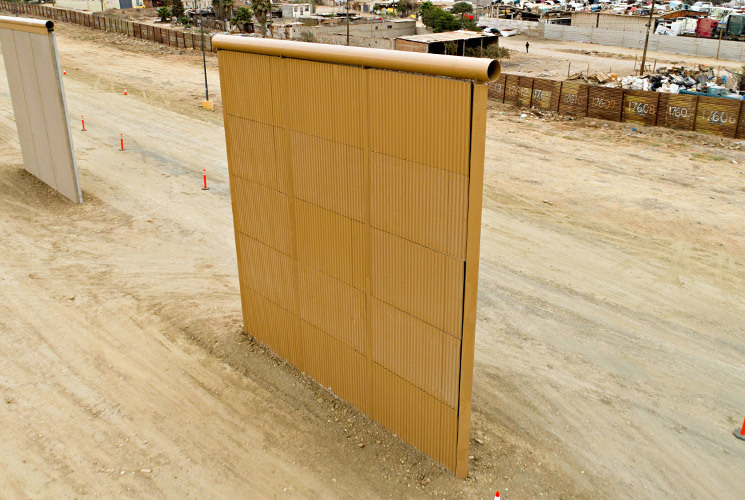 U.S. Customs and Border Protection has said no single winner will be selected; rather, each prototype will “inform future border wall design standards in some capacity"—once there’s money and Congress approves. Congress provided $1.375 billion in fiscal 2018 for barriers including: $251 million for about 14 miles of secondary fencing in the San Diego Sector; $641 million for 33 to 37 miles of fencing in the Rio Grande Valley Sector; and $445 million for replacement of existing primary pedestrian fencing in the San Diego, El Centro, Yuma and Tucson Sectors. Trump has insisted on Twitter and in other public comments that “tremendous amounts of wall have already been built” in California and elsewhere. Fact-checkers have pointed out that while some existing fence is being renovated and new fencing being built in Texas, it’s not the wall that Trump had promised. 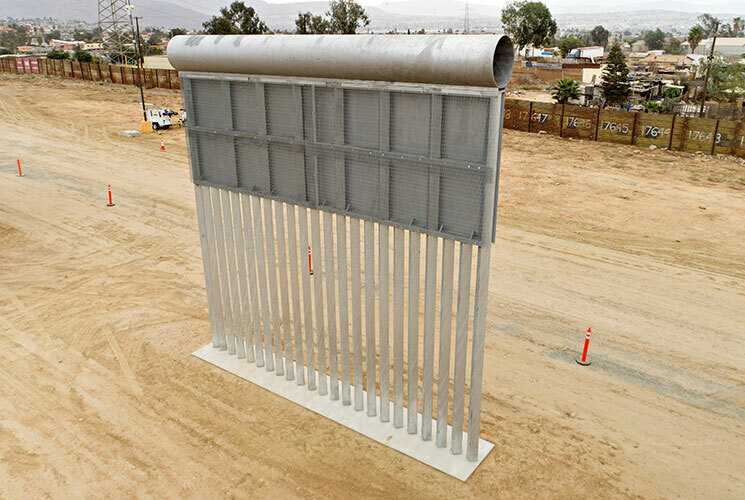 Would a wall be effective? Border apprehensions tend to decrease in areas after barriers have been constructed, though other factors likely contribute. There was a significant drop in apprehensions after fencing was built near San Diego in the early 1990s. The drop there was followed by a spike in apprehensions to the east, near Tucson, Arizona, where the border was less fortified. When fencing was extended across much of the Arizona border, apprehensions fell there, too. 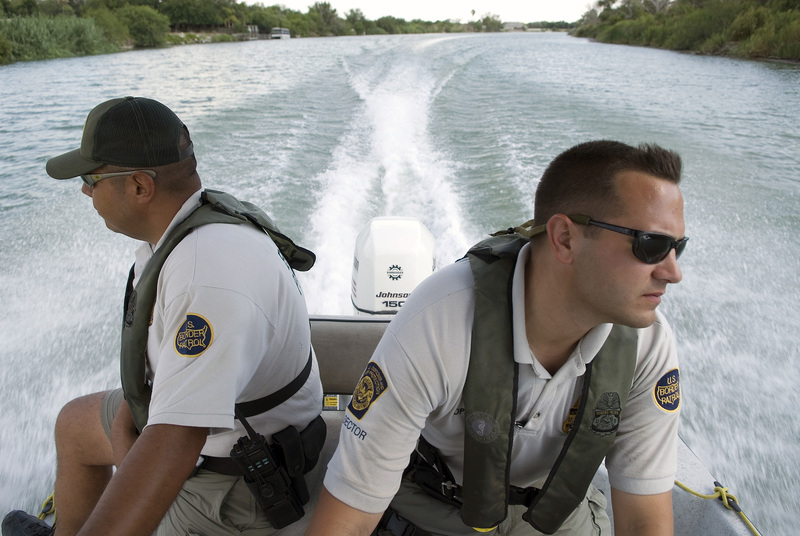 Now apprehensions are highest in the Rio Grande Valley Border Patrol Sector in southern Texas. Much of Texas lacks fencing, though there is some in the Rio Grande Valley. While fencing certainly contributed to fewer apprehensions at the U.S.-Mexico border, it is likely that several factors led to the drop. New border fencing often coincided with an increase in border patrol agents in the area. Apprehensions fell by half after the recession that ran from 2007 to 2009, when fewer economic opportunities in the U.S. may have deterred would-be migrants. It’s clear that reinforcement is not without limitations. Border agents told the New York Times that they found at least one tunnel a month from 2007 to 2010 as more fencing went up. Also, a wall wouldn’t deter asylum seekers, who present themselves to border agents at legal ports of entry and currently make up a large number of those apprehended at the border. The Department of Homeland Security said almost more than 700,000 people overstayed in fiscal 2017, about 400,000 more than were apprehended at the southwest border that same year. Would a wall stop illegal drugs from entering the U.S.? Most drugs are smuggled through existing ports of entry. Do Americans want to build a wall? Polls show that most Americans don’t support building a border wall but are split along party lines. 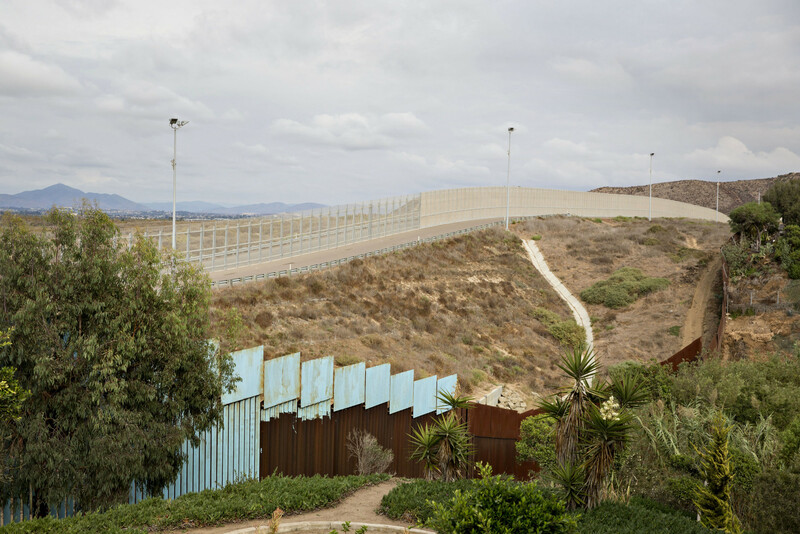 Fifty-eight percent of Americans oppose substantially expanding the border wall, with 40 percent favoring it, according to a Pew Research Center survey conducted Jan. 9-14. Overall opinion on the wall hasn’t changed much from surveys in 2018, but support among Republicans was at a record high in January, while backing by Democrats reached a new low, Pew said. U.S.-Mexico border to try to stop illegal immigration? Do you favor or oppose building a wall along the U.S.-Mexico border to try to stop illegal immigration? Other surveys have had similar results. A CBS News poll conducted Jan. 18-21 showed that 37 percent think a wall is necessary to effectively secure the southern U.S. border from illegal immigration, with 61 percent saying it can be done without a border wall. Seventy-eight percent of Republicans said a wall was necessary and 90 percent of Democrats said it wasn’t.